Mass anti-Assad protests took place in Syria’s Kurdish north on July 17th, 2012. The protests gave a 48-hour ultimatum to the forces of the Ba’athist regime: “Either defect from this regime or withdraw peacefully — otherwise, you will be forced to leave against your will.” By July 21st, 2012 the Ba’athist forces evacuated from most parts of the Syrian Kurdish region. Throughout the Ba’athist rule, Kurds have faced state racism, systematic displacement, and denial of their identity. The Kurdish language was banned at schools and other public places shortly after the Ba’ath Party took power in March 1963. Kurds weren’t even allowed to work or pursue education unless they agreed to obtain Syrian-Arab ID cards. The names of Kurdish cities, towns, and villages were also altered to Arabic ones as the Ba’athist state declared Syria as an Arab-only nation. Now, however, apart from the Syrian Kurdish capital city of Qamishlou situated in al-Hasaka province, where the regime’s vast forces still extensively operate, Kurds control the rest of Syria’s northern cities and towns, which they call the “Kurdistan region of Syria” or “Western Kurdistan” (considered part of “greater Kurdistan”). Contrary to the civil war devastating the rest of the country between the regime and the rebel FSA, the Kurdish rebellion in the north has been broadly peaceful. Kurds have appealed for the international community to support the “peaceful establishment of Syria’s Kurdistan region,” arguing that such an initiative could make the “liberated” areas “a safe haven for Syrian revolutionaries wanting to build a free democratic and plural united Syria.” However, their call has fallen on deaf ears in the international community while condemned by Turkey and its prominent NATO ally, the United States. It was on July 19th, 2012 when for the first time the news broke out in the Iraqi media about anti-Assad protests in the Kurdish north of Syria. Ten days later, I illegally entered Syria from northern Iraqi Kurdistan as the official crossing had been shut for days. The very first time I had crossed this Iraq-Syria border was in 2002, when I was in my early teens. Back then, the crossing was overflowing with Syrian military personnel, tanks, and heavy weaponry. This time around, however, apart from refugees fleeing for Iraq and a casually dressed Kurdish militiaman with a rifle firmly held in his hands, no soldiers or uniforms were to be seen at the crossing. Under the Ba’athist regime Kurdish political assemblies as such had been outlawed as acts of “terrorism.” Since the “liberation,” however, it has become a norm for Kurds to assemble, hold rallies, and demonstrate on daily basis. The biggest rallies take place on Fridays, as Friday has become a national day of action to express Kurdish rights and freedom across the country. It is usually around five o’clock when people start to come out of their homes, holding banners and placards, and head to assemble at city centers, many of which are now entitled “Freedom Square.” Men and women, old and young, and even families with their children participate in those demonstrations because they have become regular public events. 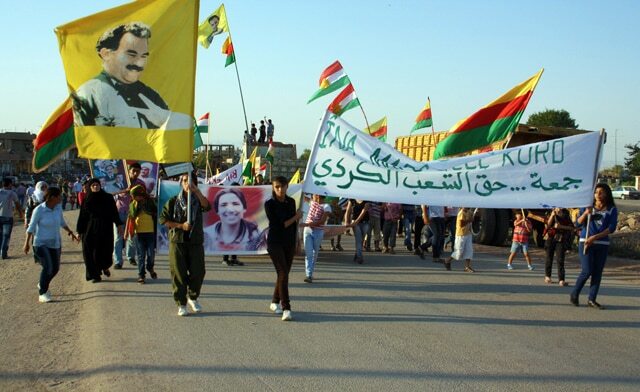 They wave Kurdish flags, photos of their martyrs, and portraits of Kurdish political leaders — most notably those of Abdulla Ocalan, the imprisoned Turkish-Kurdish leader of the Kurdistan Workers Party (PKK). Even in the yet-to-be-“liberated” Kurdish city of Qamishlou, tens of thousands of Kurds take to the streets on Fridays. Qamishlou’s streets are full of Syrian army soldiers for the rest of the week as it is yet to be fully “liberated” and their checkpoints are set up everywhere to stop and search; on Fridays, however, only demonstrators are in sight as soldiers remain inside their buildings to avoid conflict with the Kurds. The Friday demonstrations usually begin by organizers welcoming everybody from all backgrounds and declaring that Kurds do not want a war within Syria on ethnic or religious lines. “Let us praise brotherhood and comradeship between Kurds, Arabs, Muslims, Christians, Armenians, and Assyrians in Syria’s Kurdistan region. The Kurdish nation condemns war on sectarian grounds because we all deserve freedom.” These were the words the organizers declared in their first welcoming speech in central Qamishlou on Friday, August 3rd, when tens of thousands of demonstrators gathered to exercise their rights, celebrate their freedom, and dance to the beats of Kurdish revolutionary music, which had been illegal until just recently. Hundreds of thousands of Kurds demonstrating on Fridays across Syria suggests that this long neglected nation is now politically awake — thus the Kurdish north is organized to the utmost for its demands on every front, like nowhere else in Syria. After the withdrawal of the regime’s forces in July, Kurds claimed control of the cities of Efrin and Kobane along with the major Kurdish towns of Amuda, Tirbasiya, SareKanie, and GirkeLage, as well as the Kurdish neighborhoods of Sheikh Maqsoud and Ashrafiyeh in the city of Aleppo. The takeover was peaceful everywhere except in the border town of Derek, where a gun battle took place between Kurdish protestors and Syrian soldiers that resulted in the killing of three Syrian soldiers and a Kurdish activist of the Democratic Union Party (PYD), Syria’s largest Kurdish “revolutionary” party. The short confrontation in Derek was solved soon after the army agreed to evacuate from the town as it did in other Kurdish areas. 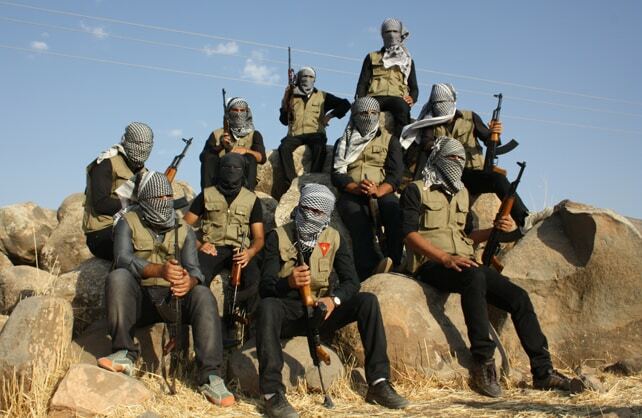 From then on, local committees set up by the PYD and its affiliates quickly took over. Formed in 2003 as an underground organization in Syria and soon outlawed by the regime, the PYD claims to fight for the rights of minority Kurds and aims to establish a “democratic autonomous Kurdistan region in new Syria.” It calls for an end to Assad’s regime while opposing the Syrian National Council, its successor the Syrian National Coalition, and the FSA forces, claiming these organizations have yet to officially recognize the rights of minority Kurds as they disagree with Kurdish autonomy in post-Assad Syria. The PYD does not function like a traditional Kurdish party directly controlling all aspects of governance in a particular province; it is only the political branch of a wider umbrella movement in Syria called “Tevgara Jivaka Democratic” (Movement for Democratic Communities), or better known amongst the Kurds by its acronym, “Tev-Dem.” Tev-Dem defines itself as a “democratic social movement” — therefore, as well as politically organizing through the PYD, Tev-Dem claims to also “culturally” organize the population through its local youth centers, women’s organizations, trade unions, Kurdish language schools, and other Kurdish cultural institutions, all just recently established and located at former government buildings and Ba’ath Party offices which the regime had evacuated back in July. Asia Abdulla, co-chair of the PYD, said, “Our party is now politically leading the democratic revolution in Syria’s Kurdistan while Tev-Dem is socially doing so. We are in search of a democratic society organized from below.” She emphasized that the PYD “is not a separatist organization like the world understands it” — it calls on Kurds to stay within the national boundaries of Syria and refuses the building of a Kurdish state, considering it an “undemocratic” political option for the Kurds in the 21st century. In sharp contrast to other Syrian regions ravaged by the inevitable outcomes of the civil war, life seemed normal in many of the recently “liberated” Syrian Kurdish cities and towns governed by PYD-led WKPC administrations, which claim to have been “democratically” elected. Self-ruling these areas, however, is not as “independent” as many Syrian Kurds claim it to be, simply because their region still receives economic resources from Assad’s government and Kurdish civil servants are still paid by Damascus, which is mainly why Tev-Dem’s PYD is accused of collaboration with the regime, the allegation it denies as “Turkish propaganda.” And, as the biggest political organization in control, the PYD gets further accused of collaboration on the basis that it does not call on Kurds to attack the Syrian army though they are very close to each other in areas like al-Hasaka province that is yet to be “liberated” by the Kurds. This makes for the obvious assumption that there is some sort of agreement between the PYD and Assad’s government. The allegations are compelling in the sense that Assad would want to avoid conflict with the Kurds in the north while fighting the FSA in the south and that, therefore, the regime may allow the PYD to take control as long as the Kurds do not strike beyond their own areas. Whether the accusations are true or not, the Kurds in Syria are now seen as the only winner amid the civil war, as they have politically gained so much without having suffered as the FSA rebels do on daily basis in other parts of country. 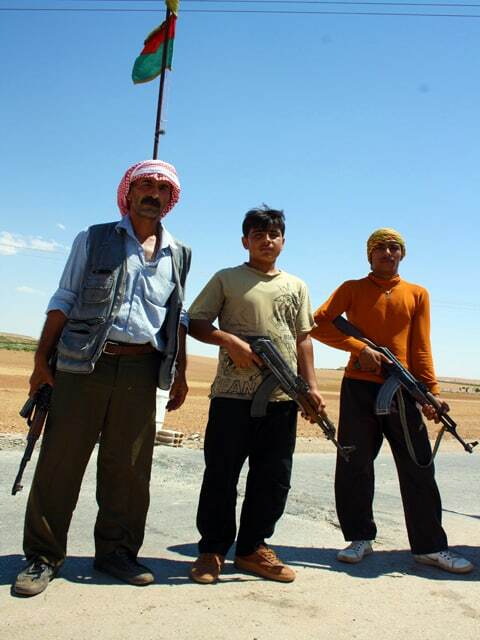 Outside the Tev-Dem movement and its PYD-led WKPC administrations, there are many smaller Kurdish political parties in Syria, fifteen of which are united in the Kurdish National Council (KNC). Although very small and having no control on the ground, the KNC sees itself as an opposition entity to the Tev-Dem movement and PYD-led WKPC administrations. There are great differences between the two sides. The KNC admires neo-liberal ideals and its delegates have met with US representatives as well as Turkish authorities outside Syria. The PYD-led WKPC, in contrast, finds its political philosophy in the ideology of the PKK founder, Abdulla Ocalan, but denies allegations that it is an offshoot of the PKK in Syria. The US and Turkey have yet to believe the denial and to this day both countries insist on classifying the PYD as “PKK insurgents” in Syria’s north. The PKK in Turkey is a designated “terrorist” organization by Turkey, the EU, and the US. One of the main reasons why the KNC has no control on the ground in Syria’s Kurdish north is that the parties that compose it are fractured and ineffective due to countless internal splits. For instance, the Democratic Party of Kurds in Syria (al-Party), which is the oldest right-wing Syrian Kurdish political party acting as the leading force of the KNC, has split into three factions, all working under the same name. The very small Party for Kurdish Freedom (PAK) is also split into two factions. And so the story goes for the rest of the political groupings in the KNC. Contrary to the KNC’s incapability on the ground, the PYD-led WKPC administrations are leading the by far largest Kurdish political movement in Syria’s history. The PYD has not experienced any splits — perhaps that is why it remains the strongest political organization that has managed with its affiliates to quickly take control of and use former Syrian government buildings and Ba’ath Party offices to publically organize the Kurds in its ranks. To avoid internal conflicts inside the Kurdish region, the WKPC’s leadership, composed mainly of PYD activists, signed a unity agreement with the KNC in Iraqi Kurdistan on July 11th, 2012, a week prior to the takeover of control from the regime. They opted for Kurdish unity to ease tensions that would otherwise badly impact Kurdish political developments in Syria. The treaty known as the “Erbil Agreement” led to the establishment of the Kurdish High Council (KHC), which both sides vowed to recognize as the highest authority taking political decisions on behalf of the Kurds in Syria. The KHC’s national joint leadership committee consists of ten seats, five of which belong to PYD-led WKPC members, leaving the other five seats to delegates from the fifteen parties in the KNC. The KHC declared formation of three joint committees to deal with international affairs, local security, and an administration to distribute food and other supplies in the Kurdish region. Each of the committees also consists of ten seats, five of which are similarly reserved for PYD-led WKPC members. The character of power sharing in the KHC makes it unmistakable that the PYD is now the biggest Kurdish political party in Syria, as it is the major player in these committees self-administrating the Kurdish region in Syria’s north. Despite the achievements in the Kurdish region, serious obstacles still remain. The Kurds believe the biggest threat to what they have gained so far could eventually come from intervention from forces inside Syria, neighboring countries, or the West. Many Kurds still fear re-occupation of their “liberated” areas by the regime’s forces, as the Syrian army maintains its presence in some of them. On route to Qamishlou, for example, we had to bypass many checkpoints set up by Syrian soldiers outside the city and, once inside, had to go undercover with local fixers. The joint KHC committees control parts of Qamishlou’s west, but the Syrian army has the rest and further controls the routes between Qamishlou and the Kurdish town of Kobane, situated next to Aleppo. A journey from Qamishlou to Kobane normally takes 5 hours by car, but it took us 24 hours to get there to avoid snipers positioned on most government buildings along the way. In the village of Slwk — next to the notoriously pro-Assad village of Til Abyad — snipers scoped on us with their laser lights, but we managed to exit the village safely. Syrian Kurds are therefore highly alarmed about the role Turkey and the US play in supporting the exile Syrian opposition and the FSA, as these opposition forces are failing to recognize the rights of the Kurds to self-determination in post-Assad Syria. Syrian Kurds generally do not trust the influential Western governments and many others in the international community that unconditionally support the exile opposition and the FSA. Kurds now comprehend how lonely they are in their fight in Syria as it is extremely difficult for them to find allies nationally, regionally, and internationally. It is precisely why, they say, they are getting organized militarily on a mass scale. Rozh Ahmad is a British freelance journalist of Kurdish origin. 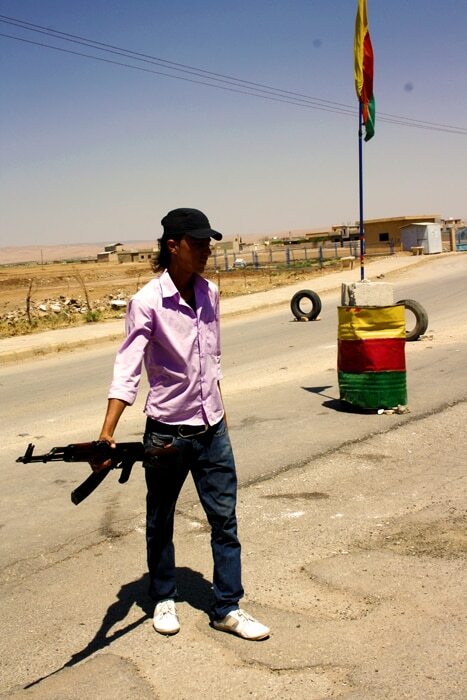 See, also, Rozh Ahmad, “Syrian Kurds — a Photo Essay” (MRZine, 20 January 2013).